In conventional, low-temperature superconductivity (left), so-called Cooper pairing arises from the presence of an electron Fermi sea. In the pseudogap regime of cuprate superconductors (right), parts of this Fermi sea are ‘dried out’ and charge-carrier pairing instead arises through an increase in the strength of the spin-fluctuation pairing interaction as the temperature is lowered. Image: ORNL. High-temperature superconductors are materials that can transport electricity with perfect efficiency at or near liquid nitrogen temperatures (-196°C). Though their operating temperature may seem cold, it is a summer afternoon in the tropics compared to their previously known brethren, so-called conventional superconductors, which operate at temperatures near absolute zero (-273.15°C). Hyper-efficient electricity transmission could revolutionize power grids and electronic devices, leading to the development of a wide range of new technologies. That future energy economy, however, is predicated on developing a theory that explains the essential physics of high-temperature superconductors like copper oxides, also known as cuprates. A sound theory would not only explain why a material superconducts at high temperatures but also suggest other materials that could be created to superconduct at temperatures closer to room temperature. At the heart of this mystery is the way that electrons in high-temperature superconductors behave in their normal state (i.e. before they become superconducting). A team led by Thomas Maier at the US Department of Energy's (DOE's) Oak Ridge National Laboratory (ORNL) has now used the Titan supercomputer at ORNL to simulate cuprates on their path to superconductivity. Titan is the fastest supercomputer for open science in the US and is the flagship machine of the Oak Ridge Leadership Computing Facility (OLCF), a DOE Office of Science User Facility. Maier and his colleagues report their results in a paper in Nature Communications. 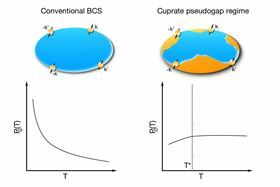 Maier's team focused on a pivotal juncture on the cuprates' path called the pseudogap phase, an in-between phase before superconductivity when cuprates exhibit both insulating and conducting properties. Under these conditions, the conventional pathway to superconductivity is blocked. Maier's team, however, identified a possible alternative route mediated by the magnetic push-and-pull of cuprates' electrons. Simulating a 16-atom cluster, the team measured a strengthening fluctuation of electronic anti-ferromagnetism, a specific magnetic ordering in which the spins of neighboring electrons point in opposite directions (up and down), as the system was cooled. This finding adds context to scientists' understanding of the pseudogap and how superconductivity emerges from this phase. At extremely cold temperatures, electrons in certain materials do unexpected things. They pair up, overcoming their natural repulsion toward one another, and gain the ability to flow freely between atoms without resistance, like a school of fish in synchronized motion. In conventional low-temperature superconductors such as mercury, aluminum and lead, the explanation of this phenomenon – called Cooper pairing – is well understood. In 1957, John Bardeen, Leon Cooper and John Robert Schrieffer proved that Cooper pairs arise from the interaction between electrons and phonons, which are quasiparticles that represent a material's vibrating crystal lattice. This explanation doesn’t, however, seem to apply to cuprates and other high-temperature superconductors, which are more complex in their composition and electronic structure. Cuprates consist of two-dimensional layers of copper and oxygen, which are stacked on top of each other with additional insulating elements in between. To set the stage for superconductivity, trace elements are substituted between the copper and oxygen layers to draw out electrons and create ‘holes’, impurities in the electrons' magnetic ordering that act as carriers of positive charge. At sufficiently low temperatures, this process, called hole doping, results in the emergence of a pseudogap, a transition marked by electronic stops and starts, like a traffic jam struggling to pick up speed. "In a conventional superconductor, the probability of electrons forming Cooper pairs grows as the temperatures decreases," Maier said. "In cuprates, the pseudogap's insulating properties disrupt that mechanism. That begs the question, how can pairing arise?" According to the team's simulations, the antiferromagnetic fluctuations of electrons' own spin is enough to form the glue. "These spin fluctuations become much stronger as the material cools down," Maier said. "The interaction is actually very similar to the lattice vibrations, or phonons, in conventional superconductors, except in high-temperature superconductors the normal state of electrons is not well-defined and the phonon interaction does not become stronger with cooling." Maier's team approached this problem with an application called DCA++, which was able to calculate a cluster of atoms using a two-dimensional Hubbard model – a mathematical description of how electrons behave in solid materials. DCA++, which stands for ‘dynamical cluster approximation’, relies on a quantum Monte Carlo technique involving repeated random sampling to obtain its results. "This model is very simple – it's a very short equation – and yet it's very hard to solve," Maier said. "The problem is complex because it scales exponentially with the number of electrons in your system and you need a large number of electrons to describe thermodynamic transitions like superconductivity." With the combination of Titan and DCA++, Maier's team now possessed the computing power necessary to solve the Hubbard model realistically and at low enough temperatures to observe pseudogap physics. Not only does DCA++ maximize Titan's hybrid architecture, but the DCA algorithm also minimizes a common problem associated with calculating many-particle systems using the Monte Carlo method, the fermionic sign problem. In physics, the quantum nature of electrons and other fermions is described by a wave function, which can switch from positive to negative – or vice versa – when two particles are interchanged. When the positive and negative values nearly cancel each other out, accurately calculating the many-particle states of electrons becomes tricky. "The sign problem is affected by cluster size, temperature and the strength of the interactions between the electrons," Maier explained. "The problem increases exponentially, and there's no computer big enough to solve it. What you can do to get around this is measure physical observables using many, many processors. That's what Titan is good for." DCA++ works by measuring notable physical characteristics of the model as it walks randomly through the space of electronic configurations. Running on Titan, the code allows for the simulation of larger clusters of atoms at lower temperatures, providing a more complete snapshot of the pseudogap phase than previously achieved. Moving forward, Maier's team is focused on simulating more complex and realistic cuprate systems to study the transition temperature at which they become superconducting, a point that can vary greatly within the copper oxide family of materials. To take this next step, the team will need to utilize models with more degrees of freedom, or energy states, which must be derived from first-principles calculations that take into account all the electrons and atoms in a system. "Once we get that, we can ask why the transition temperature is higher in one material and lower in another," Maier said. "If you can answer that, you could do the same for any high-temperature superconductor or any material you want to simulate."